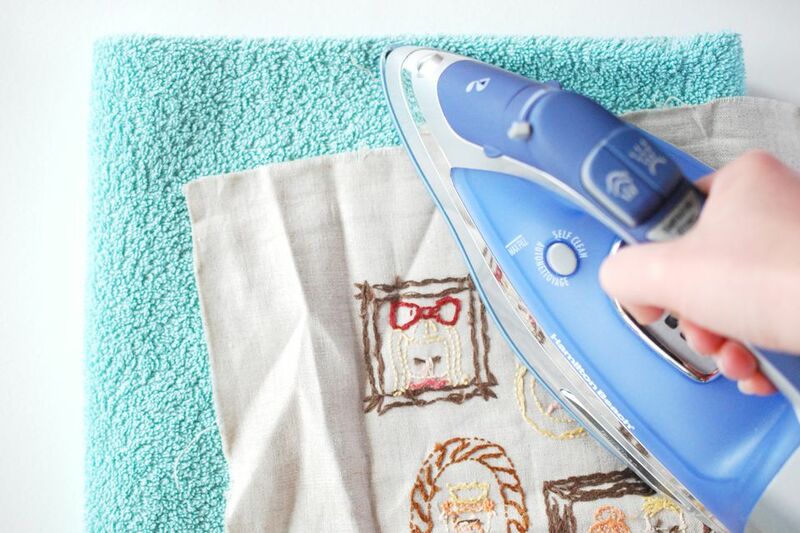 Before you start heating up that iron, working out those wrinkles, smoothing out your fabric, and potentially flattening the stitches...or something worse...you'll want to make sure you're ironing your embroidery with care. Use this guide to get the best results when ironing your stitching, while preserving all of your hard work! Fold a fluffy bath towel and place it on your ironing surface. Lay the finished embroidery face down on the towel. This will give some cushioning and help prevent ruining the stitches. Set your iron for the fabric and thread you used in your embroidery. Cotton is most common, but if you used satin thread, for example, set your iron lower. You can always increase the temperature on your iron if you need to, but it's better to work from lower to higher. Place a thin kitchen towel on the wrong side of the embroidery and gently press with a hot iron (use a setting appropriate for the materials you've used, typically cotton or linen). If this isn't working, you can carefully try pressing without the extra towel. Linen can be stubborn, so misting the embroidery with distilled water before pressing is helpful. Or, if possible, press the work after soaking, but before it has dried completely. This is especially good after using a water-soluble stabilizer. For the most stubborn creases, iron the fabric from the front, without touching the stitches. Take care to store and preserve embroidery in a way that will avoid creasing, which means less need for ironing. Ironing directly on the front of your embroidery isn't a good idea. Odds are you will wreck the stitching long before the wrinkles start to disappear. It's one of the saddest mistakes you can make with your finished embroidery. Moving the iron back and forth across your work (even on the backside) can push and pull the stitches. It's better to press down, lift the iron, press the next area, and so on. If you've already flattened the stitches, there's no need to fret! A bit of steam and some gentle fluffing with your fingers can usually bring the stitches back to life. Embroidery is often delicate and stitched with thin strands of thread. It's something that you spend many hours on, and you want it to last as long as possible. It's also meant to be enjoyed; as much as you want it to last and be perfect, it's more important to have your stitching out and being used. If that means more frequent washing and ironing, do those things with care, but don't worry about it too much. A perfect finished product isn't nearly as important the process of enjoyable stitching and sharing your work with family and friends!